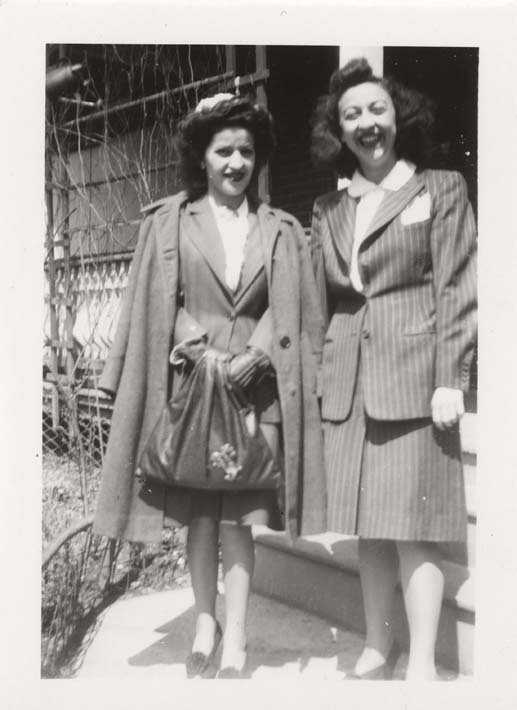 This is a black and white snapshot of Antoinette (Toni) Ciccarelli and her sister standing outside a house. Toni is on the left, wearing a pin-striped suit jacket with a matching skirt, a white button shirt, a pair of leather gloves, and a small hat. A knee-length coat is thrown over her shoulders and she is holding a large dark coloured bag. Her dark coloured shoes are a peep-toe design and has a flower detail. She is wearing dark lipstick and is smiling into the camera. Toni's sister has a big smile on her face and stares directly into the camera. She is wearing a similar outfit to Toni's but with more pronounced pin stripes. A white handkerchief is peeking out of her jacket's breast pocket. She is wearing dark coloured shoes. The two ladies are standing at the front of a house porch with white railings and a chain link fence. See similar photos, DICEA2010.0001.0013 and DICEA2010.0001.0016.